When buying a printer the first decision you need to make is inkjet or laser. Inkjet printers are generally smaller, cheaper, and provide better photo print quality over laser printers. However, if you are only going to print black and white text or will be using it constantly then a laser printer is preferred. While some inkjets just print, many inkjet printers are all-in-one, or multifunction, meaning they can print, scan and copy. All the printers on this list are all-in-ones. They also are often designed for more specific tasks like office use – designed for multiple users or higher volume in small office environment or photo printers – best for optimal photo quality. Below we review the top 10 best inkjet printers. We also have a comparison chart below the reviews so you can easily compare the specs of each printer. If you still need more advice check out our inkjet buying guide. We chose the $230 Epson Expression ET-2750 EcoTank as the best inkjet printer. This revolutionary printer uses large easy-to-fill ink-tanks instead of traditional cartridges, which means you spend much less on ink over the lifetime of the printer. In fact it comes with enough ink in four ink bottles to last for 6500 black and 5200 color pages. The biggest drawback is the time it takes to print. It has the slowest color printing ability on our list at just 5 color pages per minute. If you buy the Epson Expression ET-2750 you will spend more up front, but you will save money in the long run for high volume printing which makes it perfect for a small business or office. 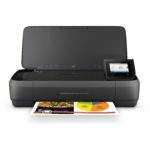 If you only use your printer a few times a week as a basic home user, then you might want to consider a cheaper inkjet printer. Another quality choice for high volume printing environments is the $180 Brother MFC-J985DW. This inkjet printer has a ton of versatility with the ability to print, copy, scan, fax, duplex printing, and wireless printing. When using the high-yield ink cartridges, the black cartridge can print about 2400 pages, while the three color cartridges can yield about 1200 pages. Combine that low per page cost with very good photo quality and you have a great choice for home offices. One common complaint about the MFC-J985DW is that it is noisy. However, Brother printers have won numerous awards for their longevity and reliability. Overall if you need a high volume inkjet printer then we highly recommend the Brother MFC-J985DW. 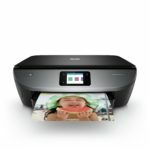 The $150 HP Envy Photo 7155 is a great choice for printing photos, especially from your mobile devices. Thanks to its Wi-Fi and Bluetooth wireless connectivity you can print easily from your iPhone or social media. You can also print directly from a SD card by using the 2.7 inch display. The photo quality of the HP 7155 is really good with accurate and rich color. It uses 2 cartridges (1 black, 1 color) for relatively inexpensive prints of less than 5 cents per page according to HP. The $280 HP OfficeJet 250 Mobile is expensive, but it is the perfect portable inkjet printer. It is small and lightweight which makes it easy to travel with. It also has a rechargeable battery so you don’t always have to have a power source. With Wi-Fi and USB connectivity you can print from any source. Despite its size, you won’t suffer from bad quality. The output is very good and the HP OfficeJet 250 Mobile still scans and copies as well. If you travel and want to have the ability to print then the HP OfficeJet 250 Mobile is perfect for you. The only real downside is the expense, so if you don’t need a portable inkjet printer then look for a cheaper option. The Epson Expression Premium XP-830 inkjet printer received the highest rating from the leading consumer magazine. It scores high marks for its versatility, ease of use, and excellent photo quality. Features of the XP-830 include wireless printing, all-in-one functions with automatic document feeder and auto-duplexing, and 5 ink cartridges (cyan, magenta, yellow, black, and photo black) for higher quality photo printing. Some users have complained about the reliability and the fact that it uses ink fast, which is costly to replace. Overall we feel the Epson Expression Premium XP-830 is a good choice for the casual home user who needs to print high quality photos occasionally. We don’t recommend it for high volume printing needs. The $150 Canon Pixma TR8520 is our highest rated Canon inkjet printer. It has excellent print quality of text, graphics, and photos along with an outstanding feature set including wi-fi, two paper input trays, auto-duplexing, and SD card slot. The TR8520 uses two black ink cartridges and three color to get its excellent photo quality. However, the running costs are a bit high. Overall if you are looking for a Canon printer that gets good results with plenty of features than the Canon Pixma TR8520 is for you. 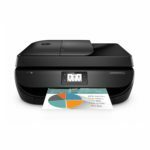 The cheapest inkjet printer on our list is the $69 HP Officejet 4650. The print quality is good, but not great. It also is a bit on the slow side when printing at 9.5 ppm black or 6.8 ppm color. For the price, though, you get a lot of features. The HP 4650 can print, scan, copy, and fax. It also comes with an automatic document feeder, auto-duplexer, and Wi-Fi. It uses 2 ink cartridges – 1 color and 1 black. Due to the low initial price, the HP Officejet 4650 is the perfect choice for a casual home user who prints a variety of documents and photos occasionally, but is not a heavy user. At just $80 the Epson Expression Premium XP-640 small-in-one provides a great value which is probably why it tied for highest rating from the leading consumer magazine. The graphic and photo quality is really good, althought text is not quite razor sharp. Other features include a duplexer, Wi-Fi, and both a USB port and SD Card slot for printing from thumb drives and memory cards. The only major missing feature is an automatic document feeder and it lacks NFC support. The XP-640 uses 5 ink cartridges – 2 black and 3 color and overall has average ink costs. The bottom line is if you need excellent photo or graphic capability in an inkjet printer that costs less than $100 then the Epson Expression Premium XP-640 is perfect for you. The $110 Brother MFC-J680DW inkjet printer does not stand out in any one area, but it is a reliable, solid performer with a large feature set. The Brother MFC-J680DW is perfect for anyone who just wants a reliable printer that won’t let them down when needed and does not need the absolute best photo quality. Another inkjet for under $100 is the $99.99 Canon Pixma TS6120. It uses five ink cartridges (2 black, 3 color) for high quality text and photos. It has wireless capabilities, but does lack NFC and Wi-Fi Direct. Photos are printed fast, but documents can be a bit slow at times. The TS6120 also lacks an auto document feeder and SD card or USB slot. Overall the Canon Pixma TS6120 is another good choice under $100 for anyone who needs to print high quality photos or graphics. Each machine is normally geared towards a specific use. There are models made for office or business settings. There are also versions for primarily photos, portable travel companions, and those that are for general multifunction home use. Pick one that is designed for the way you will be using it. Inkjet printers work by applying a precisely controlled stream of tiny ink droplets from one or more cartridges to a variety of paper types. The print quality you get is dependent on a printer’s resolution, expressed as DPI (dots per inch). However, the resolution is not the only thing that affects quality. Dot size, shape, and placement as well as the ink and paper quality will all affect the image quality. One of the most important aspects of inkjet printers is the cost of ink because in the long run this will cost much more than the printer itself. Some have one cartridge for the black and second one for the color inks. Others have a separate cartridge for each color – cyan, magenta, yellow. For photos, some newer inkjets have additional cartridges that contain lighter cyan and magenta inks, or gray ink, which can blend light areas of an image better. You should see how much replacement cartridges will cost and how long or how many photos your ink will last you. One tip that can save you money is that many cartridges can be refilled with ink much cheaper than buying a whole new one. Be wary of manufacturers claims of print speed, or how fast they can print a black or color page. The International Organization for Standardization (widely known as ISO) developed an industry-approved and internationally accepted standard, ISO PPM for black and color, specifically for inkjet printers and all-in-ones that measures default print speeds using real world printing scenarios. This is the spec you should look for which measures how many pages per minute a printer can print in black or color. A good speed is 12 ISO PPM black or 9 ISO PPM color. If printing without wires is important look for wireless models that support WiFi. Most models also have USB and other memory card ports to print without the computer. Generally, all inkjets print on standard paper (letter and legal sizes) and accept envelopes. However they can vary on other paper sizes, double-sided printing, and document feeders for copying, scanning, or faxing. They also will vary on how many sheets of paper their input and output trays can handle. You should also pay attention to the path your paper will move through the printer. Some have ‘U’ shapes that won’t work will with stiff media, instead you will want a straight-through paper path. Paper is not the only thing that many modern inkjets can print on. Some can print on discs like DVDs or CDs. Look for a machine with simple controls for scanning, copying, or printing. Some have a large LCD screen from which you can edit images without the need for a computer.